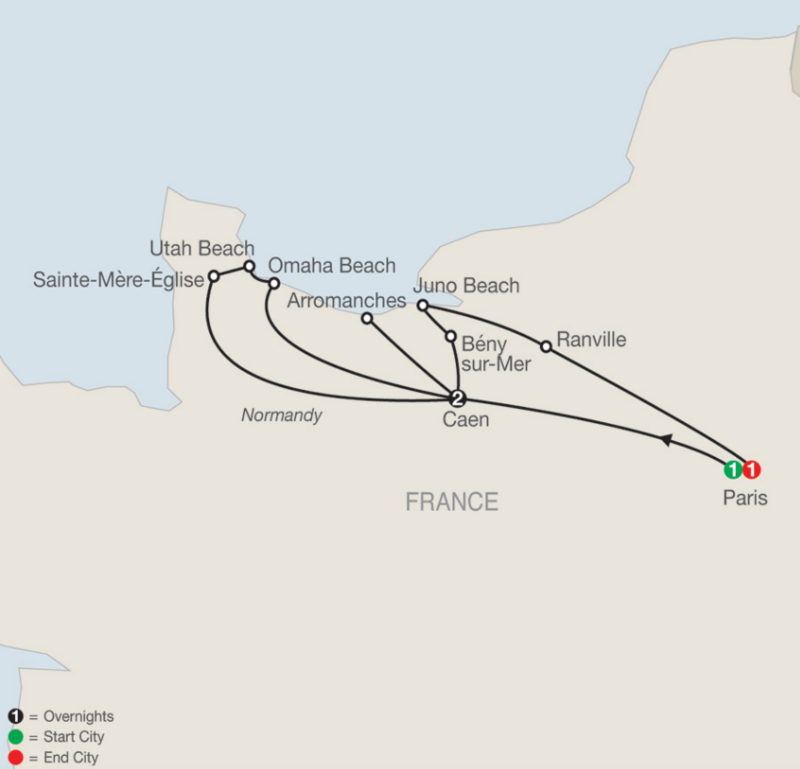 5-Day Battle of Normandy Tour Paris-Paris. Some Dates Already Wait Listed! Don't wait to Book your visit to the Landing Beaches on the 75th anniversary year! Also Available as a Private Tour – Ask us How! On June 6, 1944, otherwise known as D-Day, Allied troops landed on the beaches of Normandy and gained a foothold in the fight against Nazi Germany. On this WWII D-Day Landing Beaches & Battle of Normandy tour, you’ll visit some of the beaches where the battles took place as well as some of the museums and cemeteries that are a tribute to the Allied forces. Your tour begins and ends in Paris with two overnights also in Caen, where you’ll visit the Memorial Museum for Peace. The first American troops landed on Utah Beach; here, you’ll visit the memorials and the museum, which chronicles the history of the landing. Next is Pointe du Hoc, where US Army Rangers assaulted its cliffs. Omaha Beach is where the highest number of casualties occurred. Here, visit the nearby American Military Cemetery & Memorial. On this tour, you’ll also see the German artillery bunkers and visit the D-Day Museum, the first museum built to commemorate D-Day. In Arromanches, see the remains of the Mulberry Harbor in the bay, a temporary harbor built to quickly offload men and cargo, and the Arromanches 360 Circular Cinema, which uses archived images to tell the story of the Battle of Normandy. In Sainte-Mère-Église, visit the Airborne Museum, dedicated to the American paratroopers. You’ll visit the Canadian Cemetery and at the Juno Beach Centre, the exhibition, the bunker, and the Memorial to the Canadians. Finally, you’ll visit the Memorial Pegasus Museum, dedicated to the 6th British Airborne Division. History comes alive on this can't-miss D-Day Landing Beaches tour…. Welcome to Paris! At 5:30 pm, meet your Tour Director and traveling companions for a welcome dinner at a local restaurant. At 8 am, leave Paris and enjoy a pleasant drive to Caen. Here, visit the MEMORIAL MUSEUM FOR PEACE with its exhibits, films, and gardens. Next is Arromanches, where you will watch the movie at the ARROMANCHES 360 CIRCULAR CINEMA. Also see the remains of the Mulberry Harbor in the bay, a temporary harbor built by the Allies to quickly offload men and cargo onto the beaches during the invasion of Normandy. Continue to Arromanches-les-Bains and visit the D-DAY MUSEUM, and to Longues-sur-Mer to see the German artillery bunkers. Return to Caen. This morning, drive to UTAH BEACH to see the MEMORIALS and visit the MUSEUM. Then, in Sainte-Mère-Église, visit the AIRBORNE MUSEUM, next to the church where John Steele’s parachute got caught in one of the steeples, as portrayed in the movie The Longest Day. Next is POINTE DU HOC Ranger Monument; and OMAHA BEACH, with a visit to the nearby AMERICAN MILITARY CEMETERY & MEMORIAL. Today, start with a visit to the CANADIAN CEMETERY in Bény-sur-Mer. Arrive at the JUNO BEACH CENTER, visit the exhibition, the bunker, and the Memorial to the Canadians. In nearby Bernières-sur-Mer, take pictures of the Canada House, before continuing to Ranville, where you visit the MEMORIAL PEGASUS MUSEUM and see the original bridge. Return to Paris. * Prices are per person, based on double room occupancy, air not included. ASK US ABOUT PRIVATE TOURING! Contact us for pricing for your specific party size as well as any other information on Globus Private Touring. *Supplement pricing is per person (CA) and will be added to the standard published price for your given departure date and is based on availability. Supplement price is valid for 2019 travel unless tour will no longer be offered in 2019. Occasionally some included and optional activities & excursions may be operated with other guests. Additional restrictions may apply. Not applicable for custom groups. No Group allowances or promotions are available on Private Touring. Published itineraries only. Note that blackout dates may exist where the Private Touring option is not available.